Family-owned locally in Fort Collins since 1976, the Rainbow Restaurant specializes in serving up delicious breakfast, lunch and vegetarian dishes. Located just one block north of Colorado State University on Laurel Street near Old Town Fort Collins, the Rainbow takes pride in offering food that is house-made from start to finish and is prepared with fresh ingredients. Try the Pumpkin Bread French Toast or the Tempeh Sauté and don’t forget to check out the Rainbow’s garden patio which is consistently ranked a Fort Collins favorite! We had so much fun learning more about the Rainbow Restaurant after speaking with manager Daniel Jones in this week&apos;s community connections. What makes Rainbow Restaurant unique? We&apos;re unique because you won&apos;t find a restaurant who cares about the customer experience more than us. We think we have a phenomenal product with our tasty, healthy, REAL food, however our focus on providing the best hospitality possible is what sets us apart. Additionally, Rainbow has recently begun a more mindful approach to the way we do business, focusing on wellness for our staff and our environment. One example is that we pay our staff to ride their bike to work. This initiative not only encourages a clean form of transportation, but it supports a healthier lifestyle and a way for our staff to make more money -- everyone wins! 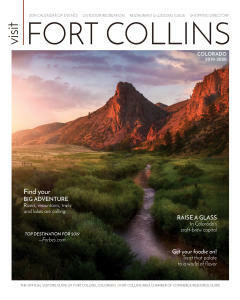 The love people have for being outside, living well, and supporting local business are just some of the reasons Fort Collins is a great town. And it’s fun to work in a restaurant like ours because I get to meet people from all walks of life from every background imaginable. Starting as a vegetarian restaurant in the 1970&apos;s, we have shifted focus and now we not only provide exquisite vegetarian food but also ​​many vegan, gluten-free, and traditional options for which are agreeable to every taste, budget, and dietary restriction. Biking everywhere! OId Town has so many amazing businesses and things to do that I rarely need to drive my car to get places. What is the story behind how Rainbow Restaurant came to be? Linda Washecka (my mother) purchased her share in the business in 1976. My father, Steve Jones, was hired a few years later as a dish washer. From there, my whole family got involved -- aunts, my grandma, my brother and sisters. And nearly 41 years and three generations later, we are still having fun! We&apos;re always trying new things and experimenting with how to make the customer experience even better. My background is in the CPA world, working in public accounting for seven years before getting back into the family business. The accounting career path was phenomenal for many reasons, including giving me a solid business background for which I found transferred quite well into how I make business decisions in the restaurant industry. Now, working in a restaurant, I feel incredibly fulfilled as I believe we are a cornerstone in our community and strive to provide value to our customers&apos; days. What do you want visitors to experience at Rainbow Restaurant? I believe our patio creates one of the most unique dining experiences in Fort Collins. Since this building and surrounding space was converted from a bank into a restaurant in the early 1990&apos;s, the patio space is now full of plants, trees, and a garden for which grows many of the vegetables we use in our recipes. The best restaurant patio in town? I think so. Management is never satisfied here. We know we do an excellent job, but live with the mindset that we can always improve. I think that makes our culture unique in the sense we always want to be better today than the day before. And I believe that transfers to a continually enlightening experience for our customers. Every day has something new to look forward to and things are never dull. Address: 212 West Laurel St.